Calling male Gambel's Quail, Tucson, AZ. Canon 7D, Tamron 150-600mm f/5.6-6.3, ISO 400, f/6.3, 1/1000 sec. No disrespect to the wrens, which I love, and of which I saw three new species (Cactus, Canyon, Rock) on my Arizona trip, but my favorite bird of the trip had to be the Gambel's Quail running around everywhere. There was constantly a covey crossing the little dirt road to our casita and they are just so adorable with their teardrop or comma shaped headdresses. I also saw them frequently along the road in other areas of Tucson. Of course, I saw them constantly the first few days of our trip, but once I resolved to photograph them, every time I had my camera and telephoto available, they disappeared or only appeared in the far distance. On the final full day in Tucson, I ran an errand to the store for supper. I had borrowed the Tamron 150-600mm lens that my uncle had rented during my stay and I brought it with me in the car. 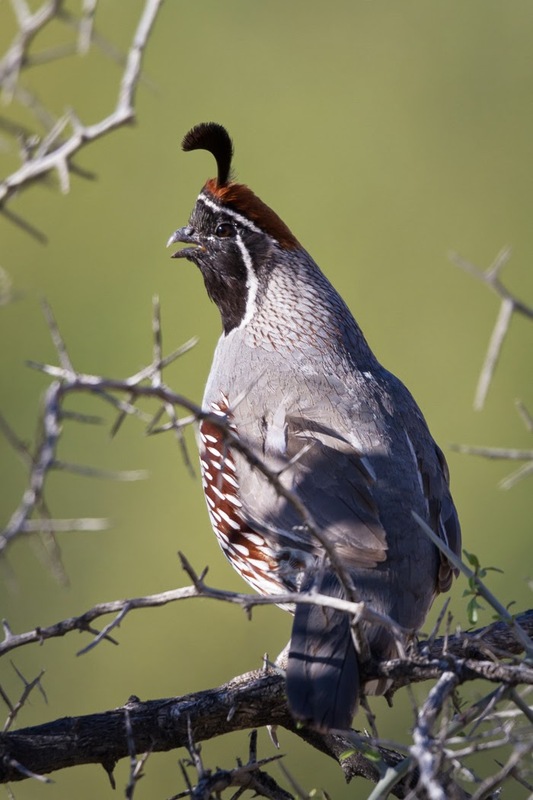 On the way home, I finally had a calling quail, sitting in a tree right next to the little dirt road to our casita. He did not seem wary of the presence of the car at all. I photographed him from the window of the car, even at one point scooting up in the seat so I could brace the lens on my knees. I might post a few more of this jaunty fellow, but I wanted to get this out before I leave for a brief weekend trip. Happy Spring!